Consumers are already willing to pay well over the retail price of Kinect just to get their hands on one right now. Microsoft's current Kinect sales figures haven't been released yet, but the resale market is showing that there's a strong demand for the device. Analysts looking at the resale market for Kinect have found that people are already paying a premium if they can't find it in stores. Kinect's $150 retail price was a bit higher than expected, but apparently this doesn't matter to many consumers. Lazard Capital Markets analyst Colin Sebastian says: "Our survey of completed transactions on eBay indicates that Microsoft Kinect, the motion sensing controller for the Xbox 360, is selling for an average price of roughly $190, or nearly a 30 percent premium over the retail price of $150." I had no problem finding the device at a few local stores, but it is currently sold out on various online retailers. This was reflected by the research done by Sebastian, who found that brick-and-mortar retail outlets had the device in stock, while online retailers did not. Sebastian thinks that that consumers paying extra for Kinect is a good sign for the industry this holiday season. "We believe that early signs of demand for Kinect bode well for the device as a holiday gift item, and if the momentum continues, could provide the industry with a near-term shot in the arm," he said. The closer we get to the holidays, the bigger Kinect resale prices could go if enough gift-givers decide they need one. The Nintendo Wii was going for a premium in the resale market for years after its release, because it was sold out nearly everywhere for the same amount of time. 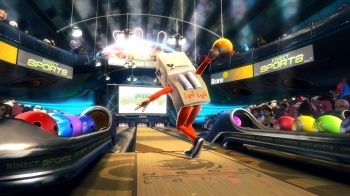 If Kinect's success replicates the Wii's, Microsoft may have truly connected with the audience it intended to develop the motion gaming extension for. Microsoft predicts that Kinect will sell 5 million this quarter, so I'll be interested to see what the official sales figures are, if they're released.